Had a lovely day in Nara today. Caught up with my sleep so didn`t get out until gone 11 but still had plenty of time to look around. I am glad I didn`t arrive until late yesterday, had I arrived at about 2 I would have had to rush the sights in and left today. Followed lonely planets walking tour and got the chance to see some fantastic temples and shrines. Most of the sights are in the Nara Koen park. The park is filled with deer and they swarm around people trying to get food. I considered buying some deer biscuits bit decided the money was better spent on feeding myself. A lot of the deer hang about in the wooded area but they also venture down by the main road and there are huge numbers of them on the paths approaching the main temples. The first stop and most impressive was the Todai-ji temple complex. As you approach the main hall pass through a huge gate with giant stone guardians. Once through you come upon the Daibutsu hall which is the largest wooden building in the world and is truly spectactular. I was so impressed by the building that I had forgot that in the hall was the largest enclosed buddha statue in the world which was also breathtaking. Swarms of school children were at the hall and I was greeted with the obligotory helllo but gangs of them who laughed when I responded with konnichiwa. The current building was built in 1709 but is only two thirds the size of the orginal building which is incredible as it is huge, the original also had two pagodas which were 100 metres high. After leaving Todai-ji behind I ascened a hill to another Japanese hall from which one can look out over the Nara plain. I continued from there through a lovely wooded area to a couple of other smaller temples before heading back down the hill. 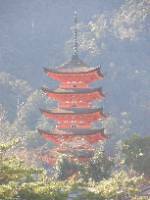 The Kofuko temple complex at the bottom has an impressive five storey pogoda. I spent a good 4-5 hours walking around and being the old man I am decided to sit on a bench in the park by a stream and read John Irvings excellent A Prayer for Owen Meany. Being the nerd I am I wasn`t satisfied with one read and sat by a lake near where I am satying and read some more while the sun set. Nara is one of the best places I have visited in Japan and I have had a relaxing day and had a chance to take in the sights without feeling rushed. The Daibutsu hall is the most impressive single sight I have seen in Japan. While Tokyo had some great sights they were second to the great energy and the sheer numbers of people who crowd the streets. I have seen some great sights in Japan but often in big cities where there was a constant rush such as with the castles in Osaka and Matsuyama. Nara is much more relaxed and I needed it after a fun but busy and sleepless weeked. Probably heading up to Nagoya tomorrow which is Japans fourth biggest city. I do not think it has a lot of sights but is a useful stop over point for the journey to Takayama which is suppossed to be a charming little city with nice mountain scenery. If I can make it to Nagoya in good time I might carry on to Takayama the same day but do not want to be rushing about so will probably visit the two over the next two days before heading back down to Kyoto and visiting the rest of the Kansai region in my last week here.